This is why you don’t buy custom URLs for an award. Adweek bought bestofthe2000s.com to give Alex the title – that domain now points to some site in Asia. 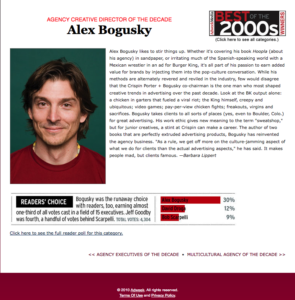 But Bogusky is MDC’s biggest star, earning him praise as Adweek’s Creative Director of the Decade last December. Bogusky has reinvented the agency business. “As a rule, we get off more on the culture-jamming aspect of what we do for clients than the actual advertising aspects,” he has said. It makes people mad, but clients famous. From the nomination page, screenshot at right from the Wayback machine. Others in the “running” were David Droga with 12% of the votes, Bob Scarpelli with 9%.